ARSENE WENGER has confirmed he will leave Arsenal this summer - here is his statement in full. Wenger will leave Arsenal in the summer, standing down after nearly 22 years in charge. Wenger has been under fire this season after another difficult campaign and fans have even stayed away from the Emirates. 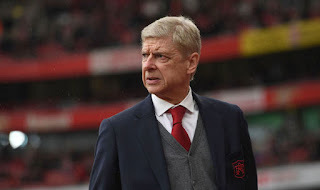 Arsenal will miss out on the top four again and their only hope of playing in the Champions League next season comes if they win the Europa League. But Wenger will leave to finally silence his critics. Stan Kroenke paid tribute to Wenger and called on the side to finish the season in good form. He said: “This is one of the most difficult days we have ever had in all our years in sport. "One of the main reasons we got involved with Arsenal was because of what Arsène has brought to the club on and off the pitch. His longevity and consistency over such a sustained period at the highest level of the game will never be matched. “We have high ambitions to build on Arsène’s remarkable tenure and to honour his vision by ensuring that Arsenal competes for and wins the biggest and most important prizes in the game.